Driving through Fauquier County, I am often reminded of the strong German history in the area – signs for Rectortown off Route 17 north of Marshall, Holtzclaw Road near Warrenton and Fishback Mountain near The Plains – all subtle reminders that German roots run deep here. The Rectors, Holtzclaws, Fishbacks, and other families were part of a group of 42 people who settled at Fort Germanna in 1714 and were later named the Germanna “First Colony,” as they were the first organized group of German immigrants to settle in Virginia. Many other Germans came as part of the “Second Colony,” in 1717. And well into the 1730s, even more German immigrants came and settled near their relatives in Fauquier, Culpeper, Rappahannock, and Madison Counties. 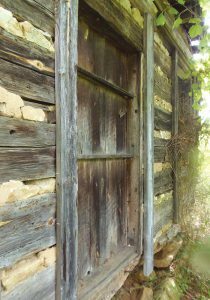 A recently re-discovered historic property with a log house and cemetery along the Rappahannock River in western Fauquier County is beginning to teach us more about this early group of Germans that settled the area. Nestled among groves of oak, poplar, and pine trees, just a few hundred feet north of the Rappahannock River is a small log house. At first look, the house appears to be just barely standing. Its western wall is bowing out and the stone chimney is crumbling from the weight of the failing wall. The logs have been removed from the northern façade of the house, leaving it open to the elements. I see window glass scattered on the ground in front of the house. I step inside. The old pine floors creak and bow under my weight. I look up to see exposed beaded joists in the ceiling, which have never been covered up. H-hinges are still attached to the little door underneath the staircase. Rose head handmade nails support floor boards on the staircase. This house is older than I previously thought. Faint writing covers the walls – bushels of corn totaled, cords of wood cut– important reminders that this property was once a working farm. One hundred yards from the house is a cemetery with a handful of fieldstones and crudely inscribed headstones. 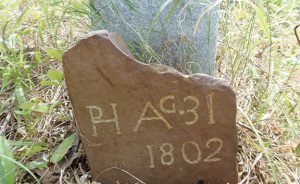 I study the stone marking the grave of Peter Hitt, a descendant of the early German group that arrived in Virginia in 1714. A crisp February day, the grass that envelops the cemetery in the spring and summer has since died and it is easy to see undulations in the earth. I crouch down to look at a clearly disturbed area near Peter’s grave that has a deep depression. There seems to be a rock that was pushed down into the earth. I run my fingers over the cold stone and begin to trace over the faint imprint of letters and numbers. It’s another headstone. Peter Heite (Hitt), grandfather of the Peter Hitt buried in this cemetery, emigrated to Virginia along with his future wife, Ellsbeth Otterbach, and 40 other Germans in 1714, as part of the “First Colony.” They initially settled at Fort Germanna along the Rapidan River under the auspices of Lieutenant Governor Alexander Spotswood, who intended to use them for mining ventures. By early 1719, they moved to Germantown in Fauquier County (then part of Stafford County), along Licking Run near present-day Midland. Peter and Ellsbeth’s son, John Hitt, had a son named Peter, born between 1756 and 1760. Peter married Hannah James at Turkey Run Church near Warrenton in 1783, following his service in the Revolution. Peter Hitt acquired a 200-acre lease in 1791 along the north bank of the Rappahannock River and west bank of Thumb Run, land which was owned by the heirs of Lord Fairfax at the time. His 200-acre lease first appears in the Fauquier County land tax books in 1799, when his property is valued at $4 per acre and his total land tax is $0.64. In 1802, Peter Hitt died and was buried just north of his home. Peter’s wife, Hannah James, remained on the property after his death. From Peter Hitt’s 1803 property inventory and appraisal, we get a unique glimpse into the lives of the Hitt family on this property. In 1803, the family owned four horses, 15 head of cattle, 15 head of sheep, four calves, and 44 hogs. The animals, coupled with the presence of two scythes, various tools, a cutting box, cross cut saw, two flax wheels, and a woolen wheel on the inventory demonstrate a small agricultural operation on the farm. A grindstone, one still, and tubs and a series of gallon measures suggests that the family also ran a small distilling operation, as well. Inside the house, the family had two beds with furnishings, and two smaller bedsteads in the living area, along with two side stables, six stone jugs, one trunk, and a mirror. In the kitchen area, the family had various kitchen furniture, along with seven chairs, several pieces of earthenware, ten pewter plates, three pewter dishes, and two pewter basins with a soup spoon. Hannah continued to live on the property following her husband’s death. She renewed Peter Hitt’s lease of 200 acres in 1840, once the property’s ownership passed from the Fairfax heirs to James Markham Marshall. Hannah died in 1846 and is buried next to Peter Hitt in the family cemetery. In the decades following Hannah’s death, the property passed into the ownership of the Cromwell and Gore families. In 1872, Craven O. Gore and Thornton Cromwell jointly purchased a 184-acre tract of land, which overlapped with the 200-acre Hitt lease. Craven, along with wife Sarah Maddux and children lived in the former Hitt family’s log house and farmed the surrounding 91 acres along the Rappahannock River. Craven and Sarah’s sons John and Joshua remained on the farm with their respective families until sometime around 1918 or 1919. Seemingly forgotten and abandoned, this small family cemetery was re-discovered in the early 2000s. In order to protect it, Russell Hitt, a distant relative of Peter Hitt, purchased the cemetery and adjacent parcel with the log house in 2006. In 2007, Russell gifted the cemetery parcel to the Germanna Foundation, a non-profit organization chartered in 1956 to preserve the heritage of the earliest organized settlements of Germans in colonial Virginia. In October 2017, the Hitt Foundation gave the adjacent parcel with the log house to the Germanna Foundation as well. As a Hitt descendant myself, and a board member of the Germanna Foundation, I was thrilled by this generous gift from the Hitt family. Research over the past year into the history of the cemetery and the log house has revealed a deeper and more complicated history. 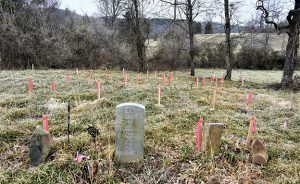 A Ground Penetrating Radar study found that this supposedly small family cemetery, with only a handful of grave markers, actually had 35 burials. 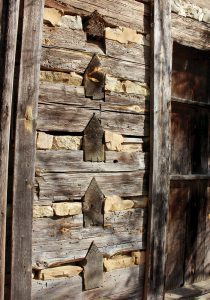 Local experts visited the log house and located a number of early features in the building such as six panel doors with H-hinges, exposed beaded ceiling joists, handmade rose-headed nails, and original window casings. A dendrochronology (tree ring dating) of the logs in the house in the summer of 2018 revealed that the logs were from yellow pine trees felled in the spring of 1800. The one-and-a-half-story, four-room log house would have been completed before the winter of 1800. 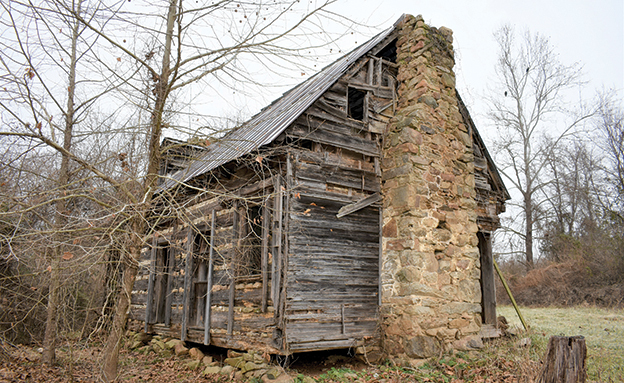 Beginning in early January 2019, the Germanna Foundation took the first steps at rehabilitating the log cabin by doing preliminary stabilization and bracing of its elements. The long term plan for the Peter Hitt farm and cemetery is still being developed, but the foundation is investigating the best ways to preserve the historic cabin and make this property accessible to the public. a 19-acre property in Culpeper County near Stevensburg that includes the historic Georgian mansion known as Salubria (ca.1757). The Fort Germanna site along the Rapidan River in Orange County, where we have an active archaeological investigation, gives us another incredible opportunity to learn about the lives of these subsequent generations of German immigrants who were pushing up against the next frontier in the late 18th century.